Gallery Sumukha (Bangalore) in association with Wei-Ling Contemporary, Kuala Lumpur presents "STRANGE PARADISE: Memories of Empire, the Gods and Mulligatawny Soup" by Anurendra Jegadeva. 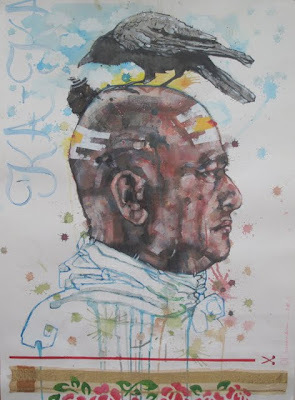 Anurendra Jegadeva is a Malaysian artist and writer of Indian descent. As far as his studio practice is concerned he believes in the enduring power of the painted image, and has worked consistently to forge effective and fresh narrative approaches to contemporary and historical themes. Strange Paradise brings together three major recent works – Portrait of My Mother as the Queen, and An Alphabet for the Middle Classes - along with his new NavaGraha Priests, nine portraits drawn in color and splatter, in a cohesive room installation. Conceptually, these works continue to explore issues dealing with the post-colonial realities of living in multiracial, multicultural and multi-religious Malaysia; of having lived in the West as a new Asian migrant; of coming home…, all the while, plugged-in to the rest of the world, the TV incessantly on since the WTC. Anurendra’s versions of the truth, perceived through the memories of distance as well as the crisis of identity are layered with autobiography, popular culture and historical contexts. Infused with an almost irreverent delight in the satirical and ludicrous, the works successfully capture and convey the complex post-colonial realities and contemporary issues in beautifully sentimental as well as disarming terms. He currently lives in a small house in a middle class suburb in Kuala Lumpur with his wife, daughter and their Pug. Note: The gallery is closed on Sundays.